With the Nokia 808 and Lumia 1020, the way of the future was set in terms of handling zoom on a smartphone - do it digitally, whether by smart cropping into a high resolution array as on the Nokia pair, or by using a high dynamic range sensor and some really smart interpolative zoom, as on the likes of the recent Samsung Galaxy flagships. But along comes Apple (with some ex-Nokia help) to break the rules, using a two-lens, two-sensor solution in the iPhone 7 Plus - one of which is a 2x telephoto. Gulp. The classic Nokia 808 PureView, showing how great camera phones have err... slimmed down! I use the 808 for the first test below only - it's just a data point here! The various solutions needed testing of course. So I headed out with the above phones plus the ubiquitous Lumia 950 XL, to snap some scenes with interesting detail that could be examined when zoomed (to varying degrees). Now, there's an issue in terms of exact comparisons, in that the Nokia 808 and Lumia 1020 both shoot 5MP and zoom in by just over 2.5x with PureView digital/lossless zoom, while the Lumia 950 'only' has 1.5x zoom at 8MP and then tries to go beyond this digitally. And then the brand new iPhone 7 Plus shoots at a full 12MP even when using the 2x 'telephoto' lens. And all with different fields of view across the board. In other words I can't always compare pixel for pixel, so please allow some leeway in the framing here! There's a variety of image processing techniques and philosophies above - the Nokia 808 and Lumia 1020's outputs are 'pure', by definition, since there's no making up pixels at all - both are showing the data at 1:1 on their sensors. The 1020 just pips the 808, but it's arguable either way since some people may prefer the far more neutral colours from the old classic. The Lumia 950 is clearly in last place here, thanks to it having to use almost exclusively lossy digital zoom to get close to the others. It's true that the iPhone 7 Plus does over-do the contrast a little, with the brickwork (in shadow) too dark as a result, but I was impressed by the detail on the leaves and washing line. 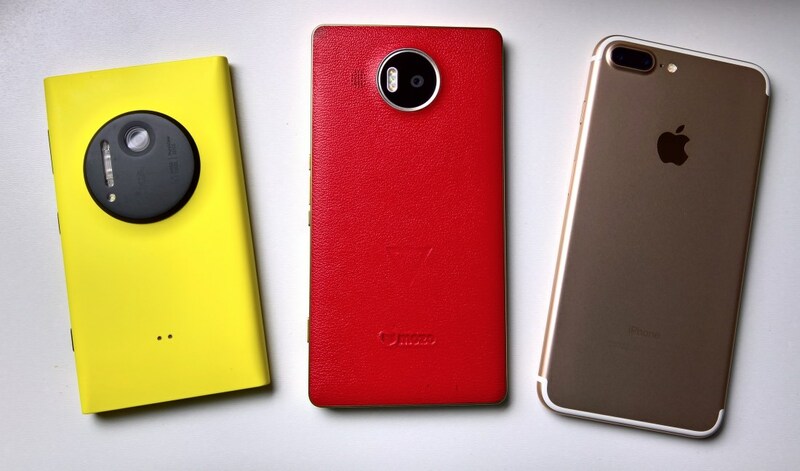 Does the iPhone 7 Plus beat out the Lumia 1020? I'm not sure, it depends which detail you look at and what your preferences are for image processing, so I'm going to call this one a draw. The Lumia 1020 output is, again, impressive at this distance - the old warhorse still coming good despite the four second shot to shot time(!) In contrast, the newer but more resolution-limited Lumia 950 is struggling with its lossy digital zoom and there's a blockiness to its output that I find a bit ugly - I still think Microsoft could improve the zoom algorithms if they had the will to do so. The iPhone 7 Plus does pretty well, with noticeable extra detail and clarity at first glance, though the more you look at elements in the image, the more the shot looks a bit over processed. Maybe my choice of subject, with the mass of regular patterns, didn't help? Overall, I prefer the 1020 image, but I have to acknowledge that there's slightly more genuine detail in the iPhone photo, even if it has been slightly (and unnecessarily) enhanced. A draw overall - again! The story is much the same here, with the Lumia 1020 managing a decent snap with no artefacts, yet with the iPhone 7 Plus getting 'closer' (optically and digitally) with just a slightly processed look as a penalty. It's a tough call. On balance, yet another draw, I think, with the Lumia 950 lagging behind by some way again. Despite the gloomy light levels, all three smartphone cameras did well here, with the Lumia 950 perhaps taking a win on colours, the 1020 producing a good crisp 2.5x zoom but (typically) with the brightest detail blown out, as here on the engine cowling. While the iPhone 7 Plus takes the most points here, with stunningly good zoomed detail and only a slight question mark over digital noise. Despite the absence of OIS in its zoomed lens Well now, this is interesting, and I'm updating this paragraph after the discussion thread below. In low light, the iPhone's software seems to know that the lack of OIS and f/2.8 aperture in the 2x lens won't provide a good or stable enough image. So, although I'd manually tapped the 2x control, the iPhone Camera app stayed with the main (1x) lens and used traditional digital zoom to get to 2x, with the larger f/1.8 aperture and OIS producing better results. Fascinating, even if it's foiling the point of my test here! Objectively, the iPhone 7 Plus still comes out on top here, with the correct wall colour (it's white) and also with the most frame detail. It's true that some of this is artificial, look the edge enhancement and other digitsl processing, plus the (fake) gold frame is a bit muted, but it's hard to disagree that its image is best of the three. The Lumia 950 and 1020 both introduce a reddish tint to the wall and over-saturate the frame a little too much. The Lumia 1020 frame detail looks the most natural and its image could probably be post processed in Photoshop or similar to correct the colours and bring out some extra contrast, but out of the phone there's a small overall win for the iPhone 7 Plus - again. Every time I think about the dual lens set-up in the iPhone 7 Plus, i.e. one normal and one telephoto, I have the strangest feeling that this is the sort of tech solution that Nokia would have pulled off, had they still been going (and not bought up and then largely sold off by Microsoft). Just as the 41MP sensor and PureView zoom system was groundbreaking, so is this - approaching 'zoom' from a totally different angle (pun intended, again!) to every other smartphone out there. Or at least until someone copies the idea. No one ever copied the Nokia PureView system verbatim partly because it became unfashionable to have thicker phones (though Sony got close with their Xperia Z line, before screwing up the software), but you can bet your bottom US dollar that Apple's solution here will be cloned in the next couple of years. Now before Lumia 950 fans howl in protest, I want to note that I still suspect the 950 is the best smartphone camera in the world, over all lighting conditions and use cases - it's just that zooming is its Achilles heel. Plus the likes of the (now tweaked) Samsung Galaxy S7 and now Apple iPhone 7 Plus are nipping at its heels in a very real way for the more general title. Leavine a few more questions to answer, and a few topics for future features, of course, if you'd like to see them. For example, indoor/party/people shots - how does the iPhone 7's quad-LED flash compare to Xenon on the 1020 and triple LED with Dynamic Exposure/Flash on the Lumia 950? Then there's the vanilla single-lensed iPhone, still three times the price of the Lumia 950, but eminently up for a more traditional 'comparator' feature.